Learn to cold smoke cheese at home. I’ll show you how to cold smoke cheese with your Big Green Egg, Kamado Joe smoker or Masterbuilt electric smoker. Smoking cheese requires some practice and a little patience. Once you learn the art of smoking cheese, you will always want to have some on hand. Smoked cheese is excellent with crackers, in salads, or used in recipes that call for shredded cheese. The key to smoking cheese is to use the cold smoking method and keep the temperature inside your grill as low as possible while still creating the right amount of smoke. 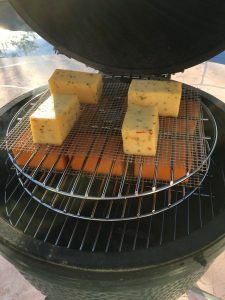 Using the Big Green Egg to cold smoke cheese adds another function to this great smoker. 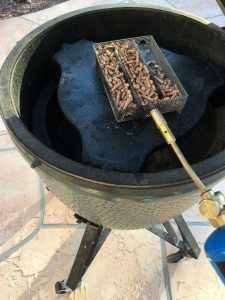 Almonds, bacon, cheese, and sausages can all be cold smoked using a Big Green Egg. 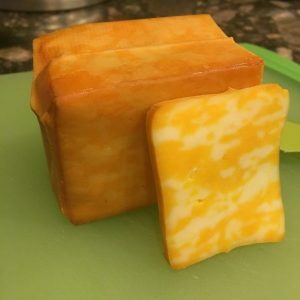 What is the Best Cheese for Cold Smoking? 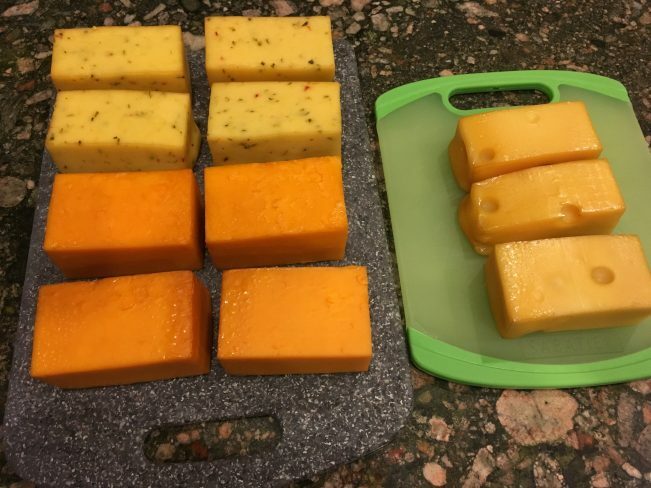 The best cheese for cold smoking is cheddar, Monterey Jack, Pepper Jack, or Swiss. I use the 32 oz blocks and cut them into three pieces. This makes decent size chunks that are easy to consume, and will also help when you get to the latter stage of this process and need to vacuum seal the cheese. Smoking string cheese is another good cheese to use when starting. Buy yourself the 12 pack and unwrap the pieces. String cheese is highly recommended because they are they are porous enough to accept the smoke. Plus smoked mozzarella is excellent! What is the Best Wood for Smoking Cheese? The best wood for smoking cheese is Apple wood. It will give the cheese a crisp but not overpowering smoke flavor. 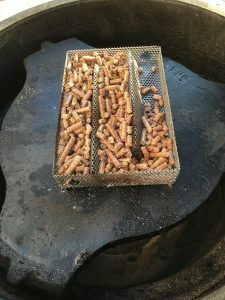 I recommend using apple wood pellets in the A-Maze-N pellet smoker. Using this method will help keep your internal smoker temperature down below 100 degrees. The next steps will lay out how to cold smoke cheese using a large Big Green Egg. I start with an empty firebox (no charcoal). I place the plate setter legs down inside the egg. Take the A-Maze-N pellet smoker and fill with applewood pellets. Place the A-Maze-N smoker in the middle of the (upside down) plate setter. Grab your torch, light it, and place it at the end of the A-Maze-N smoker. Depending on your torch you will want to burn the pellets for a few minutes so that there is a decent fire going in the pellets. Let the pellets burn for about 10 minutes to ensure a good coal base. 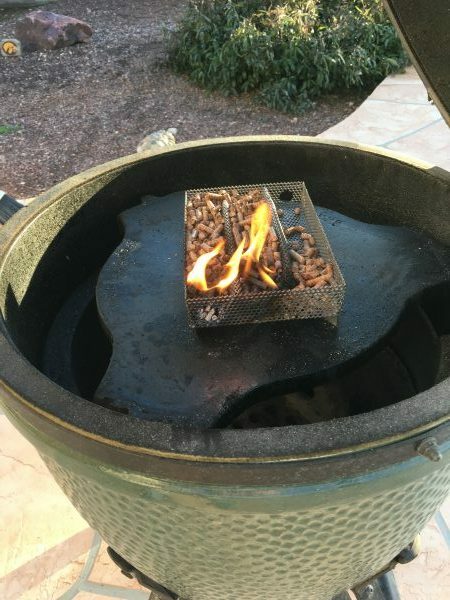 Using thermal gloves (like a Pitt Mitt), grab the non-burning side of A-Maze-N, with the other hand remove the plate setter and then pace the A-Maze-N in the bottom of the Big Green Egg. Then put the plate setter in the Big Green Egg, legs up. In terms of the ventilation on the egg, close the lower vent to about an inch or less open. Put the daisy wheel on top of the egg and turn the wheel, so the vent holes are about 1/3rd open. The goal here is to prevent is too much air flow through the chamber and the pellets catching fire. If the heat inside the egg gets over 100 degrees, the cheese will start to melt. I’ve had this happen to me, the air flow was too high, and the pellets caught fire and I had no idea until I lifted the top of the egg to find soft blobs of cheese. The next step in learning how to smoke cheese is figuring out how long to cold smoke cheese. You’ll notice that I use a tiered rack and frog mats on the grates. The tiered rack allows you to smoke more cheese in one batch. 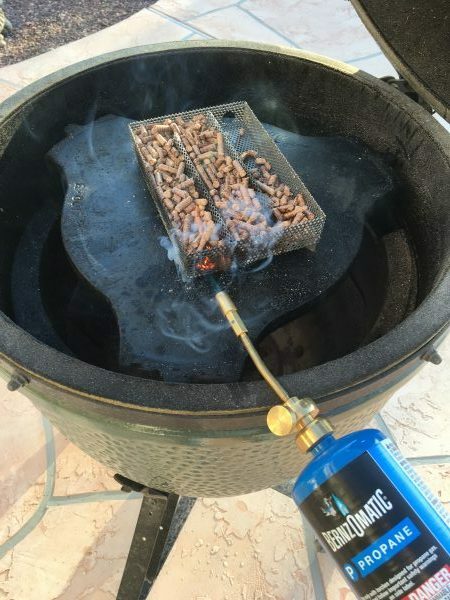 Frog mats have been lifesavers when smoking cheese, they are coated so they won’t get ruined by the cheese and if you happen to melt some cheese, they clean off easily. I highly recommend you get some frog mats as they also help keep the cheese off your greasy grates. I have a frog mat on the second tier and just used scissors to cut out a hole for the tiered rack center spindle, very easy to do and doesn’t damage the frog mats. As I mentioned at the outset of this tutorial, the most crucial part of this process is patience — you must have the patience to wait for two weeks for your cheese to cure. As a learning lesson, for the first time you smoke cheese, please cut a small bit off one of the blocks and eat it. Oddly enough it will taste like an ashtray. Now you’ll understand why we need to let the cheese cure for two weeks. Pro tip: Remove the cheese from the Egg and place on a plate or cutting board. Whatever you do, resist the urge to put the cheese in the refrigerator to cool down. The smoke from the cheese will get into your fridge air filtration system, and it will smell smokey for at least the next two weeks. The last step in this process is to vacuum seal the cheese and let it sit for two weeks. I recommend that you write the date you smoked the cheese on the vacuum sealed package, it is much easier to know when the two weeks is up that way. What is the best cheese to cold smoke? The best cheese to smoke is semi-hard cheese like Cheddar, Monterey Jack, Pepper Jack or Swiss cheeses. How long should I cold smoke cheese? Ninety minutes to 2 hours. Ultimately, you can smoke cheese as long as you want before it starts to melt. Can you over smoke cheese? Yes, cheese can be over smoked if you use a harsh wood. Hickory, Oak, and Mesquite can make the cheese taste too smokey. What is the temperature for cold smoking? Any temperature less than 100 degrees. Can you smoke cheese at 100 degrees? Yes, but not for long. 100 degrees is the melting point for most cheeses. Use the cold smoking method to keep the cheese under 100 degrees. How long should cheese sit after smoking? Cheese should sit for a minimum of 1 week in vacuum sealed package. For maximum taste, let the cheese sit for two weeks or more. I hope you found this cold smoking cheese tutorial for the Big Green Egg helpful, let me know in the comments if you have any questions. Disclosure: If there is a product that I like and it has an affiliate program, then I might link to that product using an affiliate link. By using an affiliate link, it means that I might earn a commission on a product if you buy something through that link. This doesn’t cost you anything, but I just wanted you to be aware.